"Rudy Vallee with Fanny Brice and Tallulah Bankhead"
Also known as The Fleischmann Yeast Hour and The Royal Gelatin Hour, Rudy Vallee had many sponsors, including Drene Shampoo, Philip Morris, and Kraft Foods. 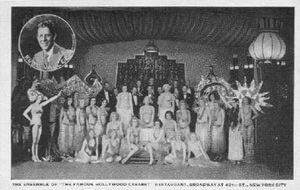 Rudy Vallee was a tough cookie, slave driving the cast of the show during rehearsals and fist fighting anyone who got on his nerves. He was known to slug photographers, fling sheet music at pianists' heads, and come down from the stage to punch hecklers right in the nose. In 1934, Radioland wrote of him, "he is the most generous of friends, willing to go out of his way to help people. But once he feels they have violated his trust, he is the bitterest of enemies." Radio Guide wrote that Vallee was "perspicuous, persnickety, and cantankerous, cold as a witch's kiss. Audiences love him. Hired hands despised him." "The Sinatra of the '20s," Rudy Vallee grew up a cocky kid with a good voice. Sax weilder and vaudeville jokester, Rudy formed his own orchestra in 1928. They played at the New York Heigh-Ho Club, where he developed his trademark greeting, "heigh-ho everybody!" He began The Rudy Vallee Show in 1928 and it was a solid hit in two years, with talented schmucks clamoring to grace Rudy's airtime. Rudy Vallee's show was very well received and influential. Once an unknown made their appearance on Vallee's stage, they were destined to become a star. Vallee discovered many up and coming entertainers. Vallee discovered those he thought "had it" and put them on his show. 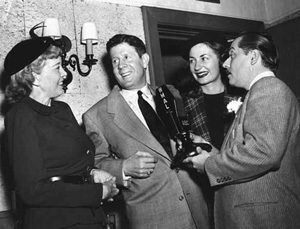 The Rudy Vallee Show made stars of Alice Faye, Frances Langford, Beatrice Lillie, Phil Baker, Milton Bearle, Joe Penner, and even Edgar Bergen and Charlie McCarthy. The Aldrich Family also began as a skit on Vallee's show. 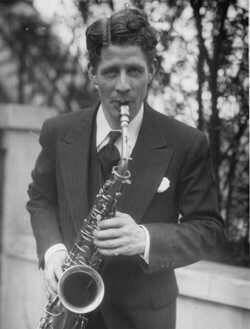 Talent scout, slave driver, saxophone player, angry punch-in-the-facer – our man, Rudy Vallee. 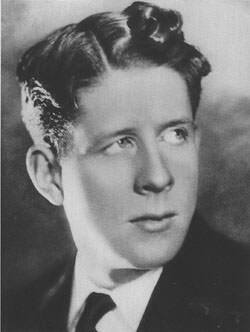 See also, Anthony Rudel's article, Rudy Vallee's 80th Anniversary. For more talent scount excitement, see also: Major Bowes and Arthur Godfrey. Be the first to comment on "Rudy Vallee"